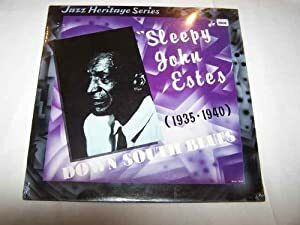 Sleepy John Estes. For my money, one of THE voices of country blues. The reason why we have the cliche “cryin’ the blues.” So plaintive, so heartbreaking, so present, so cool, so real, so powerful, so compelling. An almost laughably clumsy guitar player, and yet the perfect accompanist for himself. With Hammie Nixon and Yank Rachel of course. But really, who’d want a whole mess of guitar gettin’ in the way of that gorgeous voice? This entry was posted on Friday, May 1st, 2015 at 2:03 pm	and tagged with Down South Blues, Preacher Boy, Sleepy John Estes and posted in Blues Lyrics | Blues Songs, Blues Musicians, Recordings | Albums, Video. You can follow any responses to this entry through the RSS 2.0 feed.